OptiFree Puremoist - 6 months - Weblens - Your Contactlenses Online ! OptiFree PureMoist is an all-in-one liquid so your contact lenses (week or month) very deep cleans. OptiFree PureMoist is a new cleaning fluid from Alcon . The HydraGlyde ® Moisture Matrix ensures that the contact lenses are in a cushion of moisture all day long and improves wearing comfort, especially in sensitive eyes. The liquid keeps the surface of the lenses moist when worn for a long time ( up to 16 hours ). 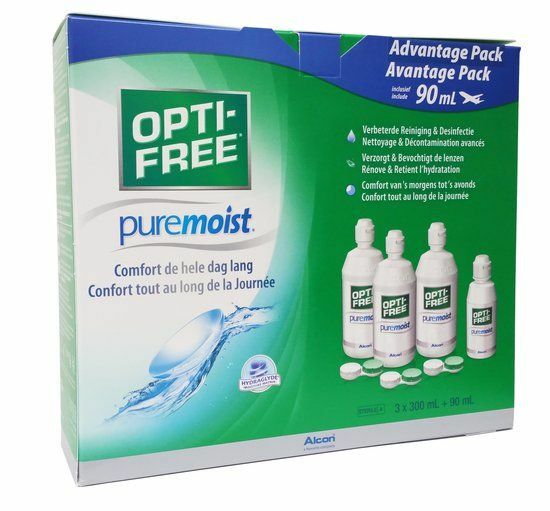 OptiFree PureMoist contains a cleaning system that removes protein deposits and provides pleasantly clean contact lenses (even if they have not been cleaned manually). The two-part disinfecting system from Polyquad and Aldox removes microorganisms that can cause eye infections.